Services - Corporate Sound, Inc.
A message from the president of Corporate Sound, Inc.
Corporate Sound has been providing Special Event Production services in the New England area for over 30 years. We take great pride in providing real world solutions for our customers and going that extra mile to make sure their experiences are good ones. I extend an invitation to anyone looking to make their next event run smoothly and professionally to contact us with your requirements and we'll find a solution to fit your needs. You will find Corporate Sound, Inc. to be a caring, accessible and knowledgeable resource that so many of our partners have come to rely upon through the years. Please feel free to review a few of our customers' testimonials at the tab at the bottom of the screen. 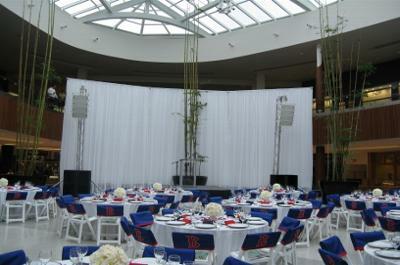 White speakers blend well into light colored backdrops and walls making for a more “transparent” sound system.